Los Angeles, CA – August 9, 2018 – GRAMMY® Award-winning bandleader Louie Vega is renowned the world over for helping to create and establish house music’s soulful Latin, gospel and jazz-influenced style. Based in New York City, Vega is a dance music legend both as a DJ and as a prolific music producer. Vega and his band, E.O.L. 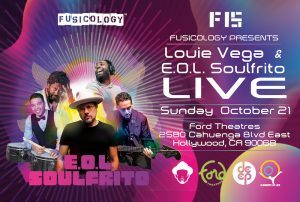 Soulfrito, will perform live at the Ford Theatres on Sunday, October 21 in a special celebratory concert commemorating Fusicology‘s 15th anniversary! Tickets are available at FordTheatres.org. With his latest album NYC Disco on Nervous Records topping the charts this summer, two GRAMMY® nominations (of his seven nominations) in the last two years, and a lifetime of adoration and success in the dance music community, Vega is certainly not slowing down! Active since the ‘90s as a DJ, producer, label operator and as one-half of Masters at Work, Vega is a permanent part of dance music history. Vega made a name for himself behind the decks in the New York City club circuit prior to branching out with studio work. Besides producing his own releases with an array of vocal and instrumental collaborators, he has produced and remixed tracks for commercial dance-pop vocalists and underground artists and producers alike. Remarkably eclectic across four decades, Vega has been deeply immersed in an array of club music styles— house being foremost—and has all the while kept the genre’s connections to disco, freestyle, rap, Latin and jazz illuminated. Among his most notable career achievements are number one Billboard club hits such as “Ride on the Rhythm,” with Marc Anthony, in 1991; Saint Ettiene’s “Only Love Can Break Your Heart;” Chic’s “Chic Mystique” and “I Can’t Get No Sleep,” with Masters at Work featuring India, in 1993; and a GRAMMY® Award for Best Remixed Recording, Non-Classical for his remix of Curtis Mayfield’s “Superfly” in 2006. His revered discography of mix albums and studio projects includes Louie Vega Starring…XXVIII, which was nominated for Best Dance/Electronic Album GRAMMY® in 2016. Vega has never lost touch with his roots, epitomized by his new album NYC Disco on Nervous Records. Born and raised in New York City’s Bronx borough, Vega grew up surrounded by music, as the son of Latin and jazz saxophonist Luis Vega, Sr. and a nephew of salsa legend Héctor Lavoe of the Fania All Stars. Vega began DJing as a teenager after he watched his neighborhood friend and hip-hop pioneer Jazzy Jay spin records. He was soon a regular at Bronx block parties and New York City events at the Roxy. After a nine-month stint at his first club, Sal Abatiello’s Devil’s Nest in the Bronx, he began spinning at the infamous Hearthrob in New York City, where he met house producer Todd Terry, who regularly gave Vega his new tracks by Black Riot and Royal House to try out on the crowd. Vega’s own first remix commissions, in 1986 and 1987, included Information Society’s “Running,” Debbie Gibson’s “Only in My Dreams,” and Noel’s “Silent Morning.” By then, he was a fixture in the NYC club scene, within DJ booths of the Devil’s Nest, Heartthrob, Studio 54, and the Sound Factory Bar (Underground Network parties). Vega debuted as a solo producer in 1989 with “Don’t Tell Me” for TVT and “Keep Pumpin’ It Up” for SBK One. Both singles were issued under the name Freestyle Orchestra, the first of Vega’s many aliases, though the majority of his subsequent solo output has been credited to his childhood nickname Little Louie Vega. Additional early success came after Vega was commissioned to do songs for the movie East Side Story, which placed him in the path of singer Marc Anthony. Vega and Anthony signed to Atlantic as a duo and released the album When The Night Is Over and single “Ride on the Rhythm,” which featured Vega’s father on saxophone and topped Billboard’s club chart in 1991. Shortly thereafter, he and Kenny “Dope” Gonzalez became established as Masters at Work (MAW). He met Gonzalez through fellow producer Todd Terry, who originally borrowed Kenny’s crew name Masters at Work for some late-’80s output “Dum Dum Cry” and “Alright Alright.” Since 1990, Vega and Gonzalez have issued hundreds of 12″ remixes and productions for major artists and some on their own MAW label. They’ve hit commercially with the chart-topping River Ocean Featuring India collaboration “Love & Happiness” (1993), and have remixed the likes of Jamiroquai, Madonna, Incognito, Janet Jackson, Aliyaah, and Michael Jackson, among tracks by dozens of other artists. Working under the name Nuyorican Soul (in addition to MAW), the two worked with such jazz legends as Tito Puente, Eddie Palmieri and George Benson for a self-titled 1997 album that reached top 40 in the UK. The success of Nuyorican Soul cut a path for Vega to lead another all-star affair, Elements Of Life, with help from fellow deep house heavyweights Josh Milan and Kevin Hedge of Blaze, along with top-tier vocalists Cyndi Mizelle, Lisa Fischer, Raul Midon, and Anané. Another career highlight was composing a song for Cirque Du Soleil with Blaze, “One Dream,” recorded by Elements Of Life and featuring lead vocalist Anané. The song was performed by The Elements Of Life Band and Cirque Du Soleil live at the 2007 Superbowl in front of 70,000 people at Dolphin Stadium in Florida and seen by 145 million viewers on television worldwide. The Elements Of Life’s activity culminated with the 2013 album Eclipse on Fania Records. The collaborative spirit continued through 2016’s Louie Vega Starring…XXVIII, on which he worked with material from Funkadelic, Jocelyn Brown, The Winans Brothers and The Clark Sisters, Lisa Fischer, Cindy Mizelle, and his long-term collaborators Anané and Josh Milan. That album was nominated for a Best Dance/Electronic Album GRAMMY® in 2016. Across the decades, Vega has also continued to tour the world as a DJ with his unique blend of house, Afro house, disco classics, obscurities and dancefloor anthems old and new. His selecting and DJing skills have been showcased on over 20 commercially released DJ mixes, such as Little Louie Vega at the Underground Network NYC (1993), Back in the Box (2007), and Vega on King Street: A 20 Year Celebration (2013). NYC Disco (2018) on Nervous Records applied many of his skills with a selection of original productions, plus remixed, edited and reworked club classics of the late ’70s and early ’80s seminal label Sam Records. Breaking down musical barriers and bringing people together through a love of music has always been Vega’s aim; after more than 20 years in the game, his contributions continue to positively influence global dance music. Fusicology was founded in 2003 by noted independent dance and urban music agent Asya Shein as a way to help promote her clients’ gigs. Fifteen years later, Fusicology is now one of the premier event guides for urban music fans in 25 cities across North America, with Shein as its CEO. Joining Shein on the Fusicology team is CTO Michael Sherrill, a respected African American technology business and startup veteran. Business and legal affairs are run by Sapna Lal, with editorial and content provided by noted journalists from across the U.S. and Canada. Fusicology’s premise and footprint consists of user generated event listings curated by niche promoters, artists, agencies, talent managers and venues. The site, newsletters and apps specialize in providing socially significant information for multicultural early-adopters, providing a rich connection between brands and a progressive cosmopolitan audience. In addition to the site, Fusicology is an award-winning full service digital, experiential and strategic boutique agency that offers targeted marketing through its expansive national digital platform, along with in-market venue activations and a vast promotional force. With an audience of over 200,000 users, Fusicology is unique in that it delivers a trend-setting young, multicultural audience. In addition to being the go-to site for notable live event purveyors like Goldenvoice, AEG Live, House of Blues, Live Nation and the LA Phil, brands that have utilized Fusicology include Red Bull, HBO, Puma, Diageo, Lions Gate Films, and many others. In addition to the Louie Vega E.O.L. Soulfrito event at the Ford Theatres, Fusicology’s 15 Year celebration will kick off in August 2018 with a new interface that includes a website, mobile apps, newsletters, and with more special events taking place nationwide in the Fall.